Maximum recommended headspeed is 2900 RPM. Mine came in at 4lbs 5oz with electronics. For the past year I’ve owned a SAB Goblin 700. It has been my favorite heli to date. The reasons are many, but include aesthetics, feel, agility, speed, design and maintenance. This left me with a desire to capture that in a smaller model when I first heard that SAB was going to release a little Goblin. At IRCHA last year I was able to finally get my hands on one. I was immediately impressed with the design layout. The most notable of which is the tail slider pushrod is located inside the hollow tail boom. This looks great, but I couldn’t help but wonder how much of a pain it must be to build and maintain the tail assembly with this design. Watching the pros fly the 500 just made me hunger for one even more. The question now is after all that time, was SAB able to deliver the helicopter that I’ve been waiting for, and what surprises would be ahead of me. These days we all have come to expect top of the line helicopters to come well packaged. SAB did not disappoint. Even more amazing is that they even show how everything is packaged in their manual. So you know exactly which box is the correct number. I love the use of their foam trays to hold the machined aluminum parts. Looks just like a display case! SAB has arguably the best manual I’ve ever seen. It leaves little need for build videos or build threads. The first thing that grabbed my attention is the great looking cover and the colored pages. On the first page I was shocked to see that they included a machined plate with each helicopter that has a personal serial number on it. You need to go the their website and register your kit so they can let you know about possible upgrades or developments. After that you will find some great data on specifications, notes for assembly, building supplies needed and recommended components. The manual has these amazing rendered photos of each step, with just enough words to fill in any possible gaps. Page 19 reveals a transmission setup that lists in table form all of the possible pinion sizes with corresponding ratios. Then on the same page gives you some setup examples with common motors and ESCs including Quantum, Kontronik, Scorpion, Savox, YGE & Castle Creations. On page 20 I was surprised to find that there were instructions showing where to place the electronics, as well as the routes in which to run the wires. Most impressive. Finally you will find everything that you would expect from nine colored pages of exploded views with all part numbers to a section on periodic maintenance. Before a build there are a few things that I do with every kit. I clean all of the hardware with 90% rubbing alcohol. I also debur all of the carbon fiber pieces using a combination of a sanding drum on a rotary tool, sanding sponges and emery boards. These two steps are often skipped by builders without consequence. It is more of a preference than a necessity. I’ve always had a fear that oil would be on hardware causing the thread locker not to properly set. I also find it a pain to handle carbon fiber that has sharp or rough edges. The manual does state on page 20 to debur carbon pieces in area where electrical wires run. I would say do that in the least. A friend once told me that you could use CA or liquid electrical tape to go around the edges to seal them and avoid sanding. Another thing I like to do is to lay a white towel down to build on so that parts are easy to see, and if you drop something it doesn’t bounce or get damaged. Typically fallen parts will just stay where they fell and be easy to see against the white towel. I should start by admitting that building is NOT my favorite part of this hobby. #1 is flying and #2 is the social aspect. Building is so far down on the list that I would have trouble counting that high. SAB not only helps take the sting out of building for me, they make it truly enjoyable. I am a machinist by trade, so I can see the true quality and care in the manufacturing of these parts. Every single part on the entire helicopter went together as designed without any tweaking at all except for the single tail pushrod guide that is located in the tail boom. The guide would perfectly allow the pushrod to glide through it when not installed, but as soon as I would screw the guide into place the pushrod would bind in it. Upon looking through the tail boom it was apparent that the outer radius of the guide was hitting against the inside of the boom. This was slightly squeezing the guide. I ended up sanding the outer radius with my rotary tool until the fit was perfect. All in all about 20 minutes was spent on correcting that imperfection. All of the ball links fit perfectly. No slop nor binding. The lengths of each linkage given in the manual was almost spot on. A turn or two was all that was required to tune the head and get everything centered. As I previously mentioned the manual gives you a recommendation of electronics placement. I ended up following it exactly. Using the HobbyWing ESC combined with the Hercules BEC left enough room for both in the ESC location. I routed all the wiring as shown in the manual. I mounted the iKon flybarless unit with the wires facing forward. This allowed me to leave the USB plugin to the back of the heli for easy access for tuning on the laptop later on. Other RC helicopter manufacturers should take note of designing a model knowing that wires are going to need to go somewhere. Major thumbs up SAB! You can use mini servos or full size servos for cyclic control. I chose the mini size since I am far from a smack 3D pilot and was highly concerned with weight on this model. The servos fit perfect although I’m not exactly certain how there is extra room there for full size servos. The kit comes with a couple different servo spacers so that you can get the linkages lined up for optimal geometry. The Savox servos fit without issue. There is very little clearance between the canopy and the linkages from the side cyclic servos to the swash. I have not seen them rub, but they are super close. Mounting the full size tail servo could not have been much better. I was highly concerned with this model having a buried tail servo and hidden tail guide pushrod. SAB really thought this through when designing these. Not only a cinch to install, but easy access to inspect and maintain. Oh, and did I mention that the hidden tail pushrod is just slick? 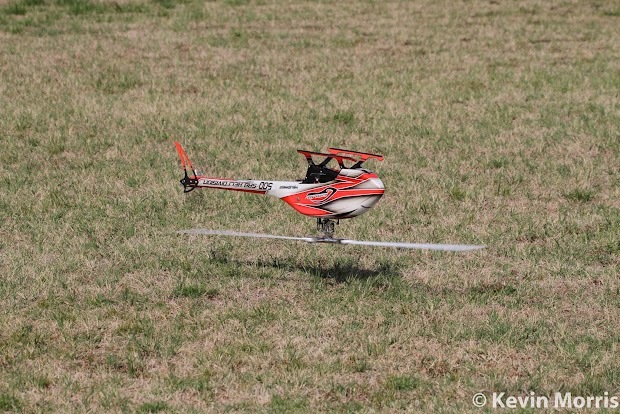 The first flight of any new model is always nerve racking for me. This one was no different, especially as this was the first time I’ve set up an iKon flybarless unit. Luckily the maiden flight was completely uneventful. I began my testing using the internal governor in the HobbyWing ESC. So there were a few test hops just to tune the adjust the headspeed and tail gain in the transmitter. After that I managed a couple of flights just trying to get a feel of the little Goblin. By the end of the second flight the bond was already made. SAB recommends batteries ranging in size from 3300mah to 4500mah. My testing was done with 3700mah and 4500mah 45C packs. There is quite a difference is size between the two packs, but more importantly roughly 6 oz of weight. My recommendation is lean towards the 4500mah packs if you plan on flying aggressively. 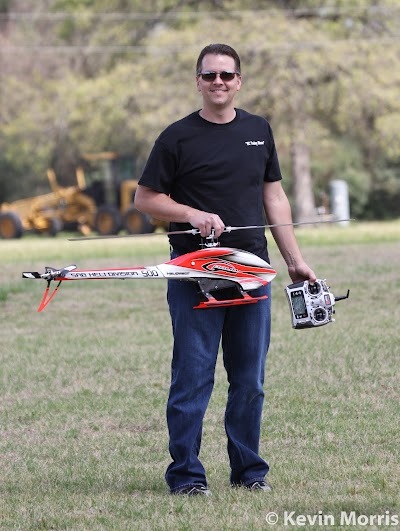 If you plan on sport flying the 3700mah will give you a 6 minute flight time at 2200 rpm. You could even get more if you optimized your power system to run at that headspeed. My style is closer to a mix of sport and mild 3d. The 4500mah packs will easily give me a 6 minute flight at 2450 rpm. For 3D, stick to the 4500mah packs and you will get a flight time between 3 to 4 minutes if you fly at a 2750 headspeed. The manual recommends not exceeding 2900 RPM due to safety reasons. Flying in 20mph winds I was surprised to see how fast I could do Rainbows upwind at 2450 RPM with about 12½° of pitch. I tend to fly my models at a modest headspeed about 80% of the time. For this I found that 2450 RPM is perfect as it allows me a good flight time on the 4500mah pack and has tons of power to perform anything I can throw at it. Occasionally I will drop into a very low headspeed for the fun of it and to practice collective management. For this model I found that 2200 gives me a long flight time and still gives me plenty of performance to moderately sport fly and even do smooth transitional 3D. Every great now and then I get the urge to crank it up and give it my attempt at smack 3D. For this I found 2700 to my liking as at that headspeed the model is almost just too fast for me. I have to give myself a little extra room to keep everything safe. 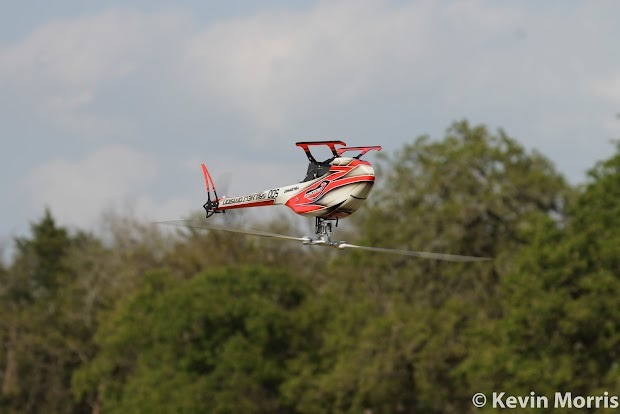 SAB broke all the molds of traditional styling of RC helicopters when they released their Goblin 700. They have kept the same styling through their release of the 630 and 770. There was little doubt that when the 500 was announced that the styling would match that of its predecessors. To be honest I was hoping they were going to release the orange color scheme that they had on one at IRCHA 2012. Unfortunately that didn’t happen and I was nervous when I saw the two color schemes were yellow/black and red/silver/white. I opted for the red one despite my concerns that it may be difficult to see in low light conditions. To my surprise the red is just amazing. The red has a “glow” to it. It isn’t apparent when you first look at it, but in low light the red just “pops”. Strictly for test purposes I flew it several times right after the sun went down and am extremely impressed with the visibility. At HeliFest in Austin, Tx I had the opportunity to see the yellow/black version in person for the first time. Let me sum it up by saying that whoever the person that is making styling decisions for SAB should have plenty of job security for years! 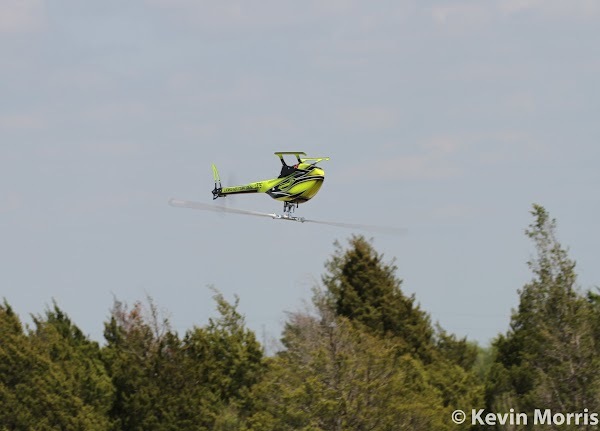 One of the most distinguishing features of the Goblin series of helicopters is the hollow molded carbon fiber tail boom. There are no supports and the boom is not round like all other helicopters before it. The strength of the boom is a remarkable feat of engineering. I have tried to flex and bend it, but man that thing is stout. Not only does the design eliminate the need for supports, but allows for amazing visibility in all orientations that some other helicopters lack. It gives a wonderful pallet for talented painters to go crazy and express themselves versus those of us whom had wrapped trim tape around the end of the tail boom for visual cues on the standard round boom. On all of the Goblin helicopters SAB incorporates break away bolts so that in a crash the boom has a chance of survival. The 500 is no exception. They use two nylon bolts that hold the top of the boom to the frame that should break in a crash. The bottom of the tail boom has two protruding features that are squeezed by the side frames holding it snug. Again, used to allow the boom to separate from the frames in the case of a crash. Innovative and simple. Then they went and ingeniously routed the tail pushrod inside the boom in a way that does not interfere with the belt not only for aesthetics, but to protect it from harm in transport and handling. For the 500 SAB left the DFC head behind for the new HPS (High Precision System) that allows owners to use a higher range of headspeeds. They have tested the model from 1800 RPM all the way to 3000 rpm. If you are flying between 1800 to 2400 you may notice some swaying. All you need to do is slightly lower or raise your headspeed to get out of this harmonic zone. The phenomena does not exist above 2400 rpm. What? Transmission on a heli? Well, sort of. Like its bigger brother the 500 utilizes a unique design to drive the main shaft from the motor than any other heli out there today. The motor pulley drives a belt, this belt turns a shaft with a helical gear that then drives the main shaft. So the obvious question is why do this when all others are using a pinion and main gear. This allows for the main shaft to be really short because there isn’t any need for gears down low. This allows the battery to be strategically mounted directly in the bottom of the frame without interference. Another advantage is that is keeps everything very slim for an extremely aerodynamic canopy. For us that are power hungry there is little need to worry about stripping main gears. The belt allows just a little “give” in the system and acquiring the desired final ratio in two steps rather than one allow less load be put on any one component. One thing to take note of is the lack of any horizontal adjustment in the gears and pulleys. Talk about faith in quality. This means the gears may be a tad tight the first few flights. No worries as they will break in quickly. The kit does include shims to adjust the vertical play in the shafts. Check the motor belt, tail belt, dampers and gears regularly or at least every 100 flights. The parts on the tail shaft undergo the most stress. Check them frequently and replace when anything is in question. Also lubricate all moving parts on the tail and swashplate periodically. Inspect the tension on the belts, that all screws are tight, and that all wires remain isolated from carbon fiber and aluminum parts. Of course there is always something that could be better. For me on the kit it is 100% without a doubt the canopy screws. The canopy is generally difficult to remove and install on the Goblins and the 500 is no different. Don’t think that SAB took the easy way out on the canopy screws. The machined aluminum screws with the inset O-ring is not cheap or easy to produce. The problem is design. Screwing aluminum into aluminum repeatedly is not a good idea. Then they compounded the problem with fine threads. This makes the possibility of cross threading the screws quite high. I have also heard that the screws can come loose in flight and then you are done flying until you can order new ones in. I would have preferred that SAB use a different method altogether to attach the canopy at those points. Picking a favorite feature on this heli should have been difficult for me having so many good things to choose from. However it is the battery tray hands down. The new sliding removal battery tray is the best design I’ve seen on any helicopter. The rails are molded into the plastic that holds the frame halves together. SAB was kind enough to provide 2 battery trays in the kit as well as 2 extra long Velcro straps that hold the battery to the tray. The battery is installed in less that 2 seconds and removed in less than 5. Simply pull on an aluminum part and the tray will slide right out. No pins to align or clips to install or remove. Another thing to note is how well it “snaps” into place giving you confirmation that you can trust its security. You may ask why this is so important to me? Simple. Loading and unloading batteries is what you will have to do the most in any helicopter’s life. So if the batteries are a pain to install and removal, then the heli may just be a little less enjoyable. 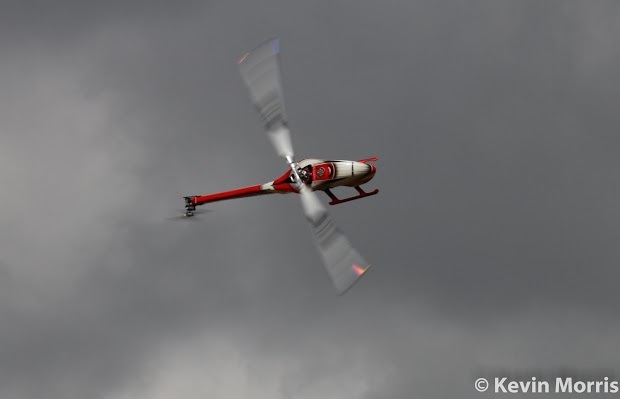 Why do I want another heli? Where am I going to fly it? In what style do I plan to fly it? What charging equipment do you have? The reason I wanted to bring these up first is that I have often spoken with people that told me they were not satisfied with a certain helicopter. Every now and then I find out their helicopter was doomed before it ever had a chance, meaning that that particular helicopter just was not designed to do what they were trying to do with it. There are numerous reasons that this could be your next helicopter. 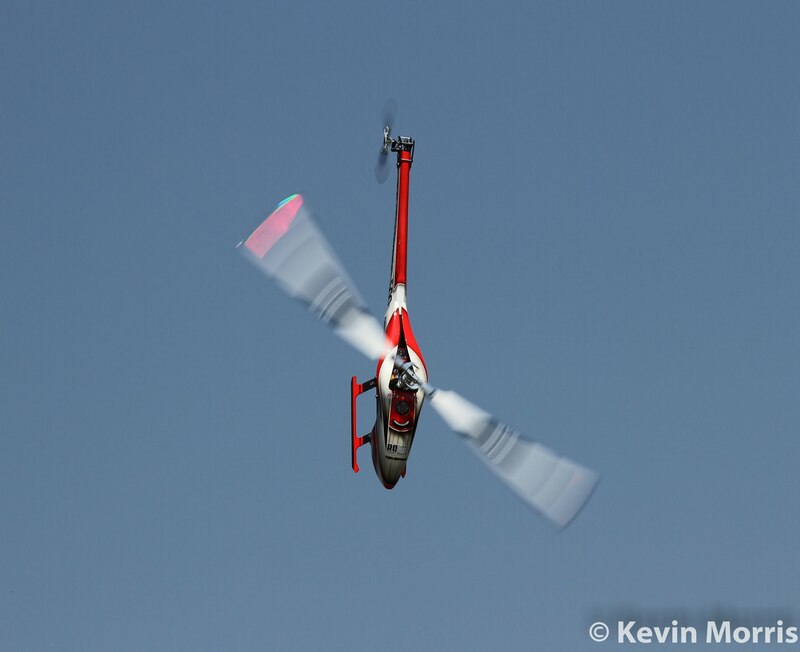 The Goblin is arguably the most visible helicopter in production. So if you don’t have the best vision, or if the thought of losing orientation scares you, the Goblin may be the one. But why then would you choose the 500 over its three bigger brothers? One reason is that if you have a limited space to fly in. Flying too large of a heli in a small space can be troublesome for some of us. 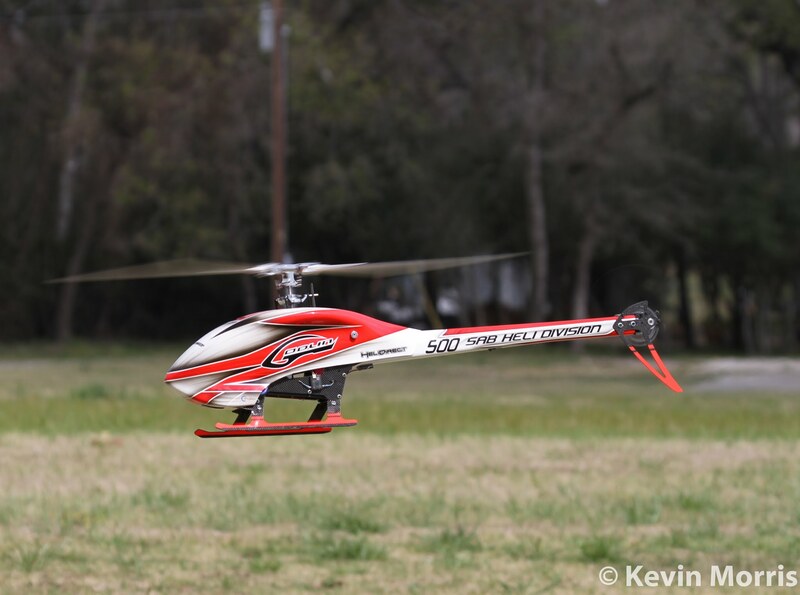 I prefer my 700 when I am at the field, but my 500 when I am at a funfly with small flying boxes or at a park. Another reason is price. 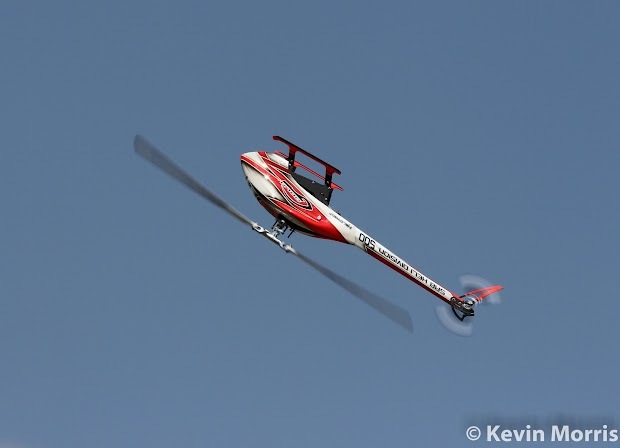 Although the 500 isn’t exactly cheap, it is quite a bit less of an investment than the larger helis. Additionally the 500 only uses a single battery. This is less cumbersome than dealing with two batteries per flight or dealing with high voltage setups. This also allows for less demanding and pricey charging equipment. Most of the chargers today will charge a 6s lipo. Well then what about flying style? There are hundreds of videos out showing how fast and hard the 500 will fly, but what about if you want to sport fly or fly at low headspeed? Not a problem. I have flown the 500 at as low as 2000 rpm and it flies just fine. Personally I prefer 2200 as my low headspeed because you can sport fly it or do mild and smooth 3D. Then if you want to do a flat out speed run you could crank the headspeed and prepare to hang on. To say that I’m pleased with this helicopter would be a drastic understatement. The kit was well packaged, the manual was the best I’ve seen, the assembly was the most fun I’ve had building, the electronics was the easiest I’ve seen to install and route wires, the setup was easier than usual with accurate marking on the blade grips/head block, and most of all it is just stunning to look at. For a smaller model it remains maneuverable even at lower headspeeds, yet is able to handle the hardest smack 3d you can throw at it. This is a testament to SAB and their new head designs that allows for a much broader range without changing dampers or settings. The kit is a great value considering all that is included, the materials and design. This model should prove to be rather inexpensive to maintain and service. The Goblin 630 and 700 has an aluminum mount that attaches to the carbon fiber side frames and landing skids. When you land on the skids too hard, the aluminum could bend and in some cases even crack a side frame. SAB addressed this on the 500 and made those brackets out of a plastic composite The advantages being that now these brackets are light, easy to replace and very inexpensive. During one of my flights I plopped it down from about four feet up on an asphalt runway. This snapped the front skid bracket but everything else was fine. The front and rear bracket are identical, and for two of them you will pay around $6. So definitely a big plus and something you may want to keep in your extras. The Goblin 500 will auto rotate about how you would expect it to. It is not going to float in as a 700 would, so you had better be fairly experienced before you begin trying aggressive trick autos. If you are not an expert at autos, don’t worry as you will be able to auto it down in the event of a power failure without any problem. So far I have between 40-50 flights on the Goblin 500. It is everything I expected it would be. This heli satisfies all the needs I had for a model in the class. From the ability to fly smooth for 6 minutes, or to fly hard and fast in the same model is a bonus. Minimal maintenance, amazing performance and a stunning appearance is certain to keep it at the top of its class for a long time!